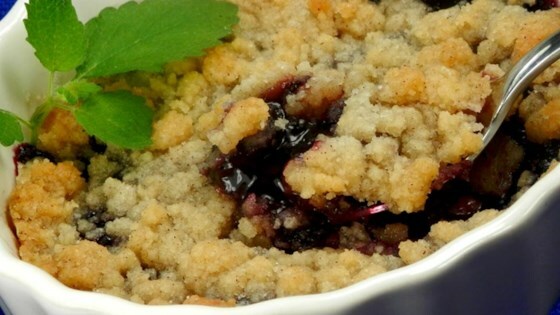 "The mayonnaise adds a little tang to this delightful fresh blueberry crisp. It's really delicious." Place the blueberries into an 8 inch square baking dish. In a medium bowl, stir together the flour, sugar, and cinnamon. Stir in the mayonnaise until the mixture resembles coarse crumbs. Sprinkle over the top of the berries. This cobbler is bursting with blueberry flavor, a great summer dessert. Nice, But I do think it would be even nicer with a doubled "Crisp" topping. Recipe was very quick and easy to prepare. We enjoyed it very much! I used last years crop of frozen blueberries and it worked fine. I like sweet things and when I saw mayo in this recipe I was skeptical. Don't be afraid! This is GREAT! It taste magnificent. Go ahead and try it, you'll be glad you did! We thought adding mayonnaise was wrong on so many levels and only made a half recipe because we were skeptical. It not only tasted fabulous but was extremely easy to make. Excellent! I'm not much of a baker, and this was super easy and really delicious. This is going in the keeper file, thanks!